It all started with the question: 'What does one do if one does not speak very well, one's speech is quite unintelligible and one is asked to give a talk in school?' When our son David (born in 1984) was ordered (rather than asked) to do so many years ago, we did our utmost to invent a way to keep it from being a flop and just another failure experience. Realising that he could read much better than he could talk, and that his reading was also far more intelligible than his spontaneous speech, we came up with the idea of an oral presentation with subtitling. We produced a series of cardboard 'screens' for David to hold up in front of the class. On the front there was a picture and a very short statement in catch words printed so large that it could be read from all corners of the class room. On the back, facing towards David, there was a full sentence relating to the picture on the front that David could read relatively easily. The class, then, at least had the catch words, while David could read the extra information aloud. That worked quite well. A few years later we realised that from there it was, in fact, just a short step towards a PowerPoint-like presentation. Hopefully our experiences, described below, will stimulate other people to do something similar. We began by making a simple presentation on a laptop using the programme Presentations (by Corel, long ago the precursor of Microsoft's PowerPoint). Therein we had David 'tell', so to speak, about his own life with Down syndrome, as he was living it. By showing photographs he explained what he did in life, what he liked and what he didn't like, what he found easy and what difficult. Of course, all this could only be done in close co-operation with David himself. It was our intention that, while presenting, he would read the short texts on the successive screens aloud. In that way, his audience could at least read along with him where they could not understand his speech. In doing so, David would be understood quite well, we hoped. 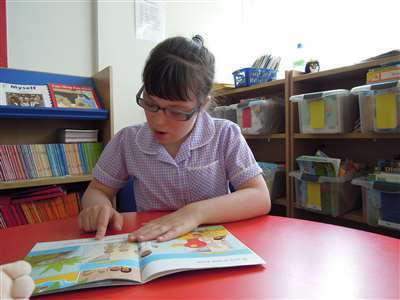 But, apart from that, we thought that the simple fact that a boy with Down syndrome in front of a group, with quite some flair and a mouse in his hand, operating his own laptop, proved to be able to read aloud reasonably well should make a very positive impression. Towards the end of 2001, we put the concept to the test on a stand at a symposium of obstetric and gynaecology nurses. That afternoon, David, standing beside the laptop, did his presentation almost a dozen times with much flair and dedication, albeit only before a very small group of listeners each time. But he enjoyed it very much, getting all that attention and telling his own story. A few weeks later, we threw him in at the deep end by letting him give that same presentation in front of an audience of about 80 baby clinic professionals, physicians and related personnel at the Leyden Academic Medical Centre. There, for the first time in his life, he sat in front of his audience, facing it and reading from his own laptop screen into a microphone, while his 'slides' were projected in a huge size on the wall behind him. And it went all right! So, all in all, this concept proved to be a powerful method of having more information given by somebody with Down syndrome himself, particularly promising for the less (and possibly far less!) able speakers. Another 'exercise' opportunity presented itself during an 'open day' at Parc Spelderholt, a venue for the education of individuals with a disability towards a more inclusive life. Presenting from a stand behind his laptop was by then a mere routine. D.: Good afternoon!! I am David. Do you have Down syndrome as well??? D.: No ??? I was afraid of that!!! D.: Is there nobody else with Down syndrome in the audience? D.: Oh, good!! I thought I was out here totally on my own. Now, is there a doctor in the audience??? D.: That's a safe feeling!! For us as parents it proved extremely thrilling to watch David in action - loosely making jokes between his 'fixed' (and extensively rehearsed!) texts, initially clearly a bit nervous - and not being able to intervene. (If we had done so, in front of the large audience, it would certainly have been to his disadvantage!) But he did a wonderful job and certainly made people think. A few weeks later David was invited to give a 'keynote presentation' at the Dutch Fifth Day of the Child with a Chronic Illness, and that would be even more thrilling, because an audience elsewhere was expecting to hear both Marian and myself on that same day. Therefore, David, accompanied by the present SDS director, Mrs. Jeannet Scholten, travelled to the lecture theatre near the centre of the country, without either of his parents near at hand. And as we were told by others, from the organisation as well as from the audience, it went OK again. A new development was that we had taught David to stand up in front of the audience instead of remaining seated, as he had done so far. Around that same time our Secretary of State for Welfare, Mrs. Clemence Ross, announced that she was planning a working visit to be informed about Down syndrome. She wanted to talk with SDS officials and, much more importantly, with individuals with Down syndrome themselves. Because she liked the idea of officially opening the new SDS office outside our own house, where it had been for the first fifteen years of its existence, 'using' David was obvious again. As his parents, we knew very well that a spontaneous ad-hoc discussion with him would have a large (much too large) 'soap' content (he simply digs TV soaps!). So, what better than asking him to give a presentation about his own life once more? This time a presentation with far less SDS political content, as had been the case so far. And so it happened. And it worked again. David liberally varied his text projected in large scale on the wall and, while doing so, could show very well how his life was organised by the three of us together and enjoyed by him. He explained the importance of being able to catch an accurate, local weather forecast in order to determine whether he could travel to his internship by bike, how he went to school for one day a week and what kind of difficult language concepts he had to master there to become a 'care assistant', what his hobbies were, etc. While doing so, we were able to illustrate a fair number of the screens with digital photographs that David had taken himself. All in all, at that stage we had already concluded that the development from an 'oral presentation with subtitling' towards a computer-presentation for David had been a very good one. So much so, that we were not afraid of trying the next step: a presentation like he had given for the Secretary of State, but this time not in his own native language. I did not write this speech myself. And still they know very well what they are talking about. En still dee noo verrie wel wot dee aar tokking ehbout. Because of all his (forced) rambling around the Dutch school system and the loss of time in a very unwilling secondary education scene, David has had hardly any kind of structured education in a foreign language. However, he has a keen interest in that, so we attempted to add more or less phonetically written cues in smaller print underneath the lines of his actual presentation in English or German. And in the course of time, David learned to read below his original lines, while we gradually learned how to write these phonetics-adapted-for-David. That is to say, we had to devise English sentences that were first and foremost pronounceable for David rather than being 'optimum' English. In addition, using real phonics would have required David learning quite a number of extra graphemes. Much too time consuming! And then the first test happened, notably a presentation in English at a symposium in Luxembourg. Upon arriving at the theatre he had to adapt to the fact that his computer was, totally unexpectedly, standing somewhere amidst his audience and not in front of it and, in addition, he had to hold the microphone in his own left hand (to be able to operate the mouse with his right one) instead of having it fixed in front of him. Notwithstanding that, he did it again and enjoyed very, very much to be able to do so. Many singers sing in English but are unable to speak it! Menni singers sing in Inglisj but aar uneebul to spiek it! In the meantime, an official invitation for David to present an updated version of it all at the next World Congress on Down Syndrome in Singapore has already arrived. This time we're really getting somewhat nervous. More slides from David's presentation were included in Down Syndrome Issues and Information, Volume 3, Issue 1, pages 6-8.